Vin Scully has called Dodgers games for 66 years. 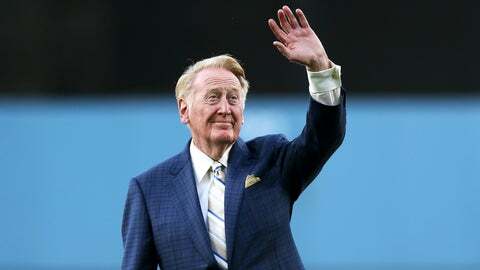 LOS ANGELES — Hall of Fame broadcaster Vin Scully won’t be calling any games in the baseball playoffs after undergoing a medical procedure. The Los Angeles Dodgers said Thursday that Scully was resting comfortably after a recommended procedure earlier in the day. The team didn’t specify what the procedure was. Doctors advised Scully to skip the playoffs in order to rest up. Scully, who turns 88 in November, said in August he expects next season will be his last in the booth. His 66 years with the Dodgers are a broadcasting record for the same big-league franchise. Scully missed the team’s final series of the regular season because of a cold, and he wasn’t in San Francisco for a four-game trip earlier last week because of a scheduled absence. The NL West champion Dodgers face the NL East champion New York Mets in the NL Division Series starting Friday.